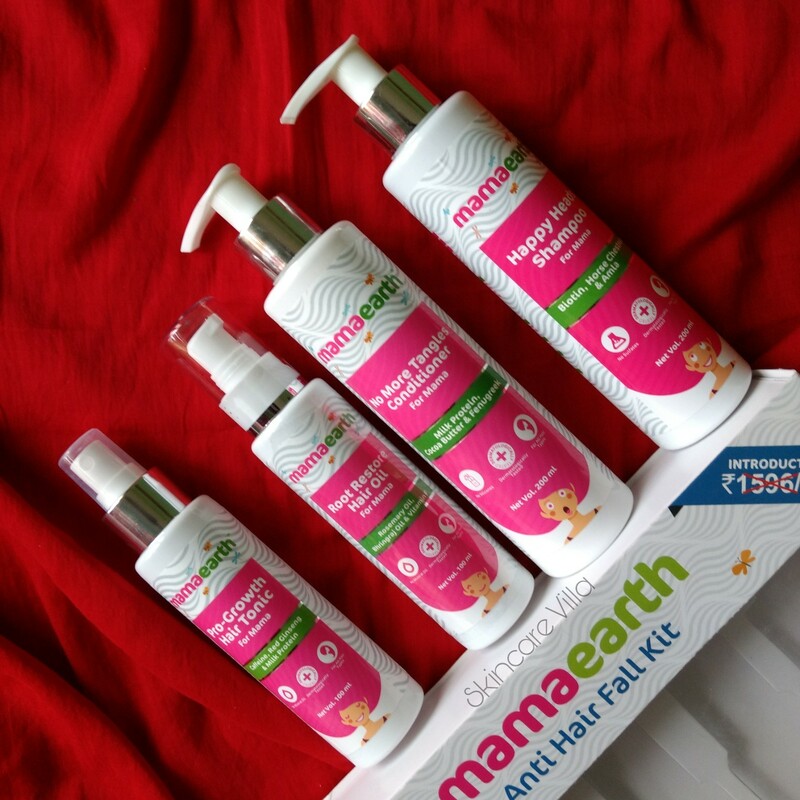 MamaEarth is a brand which I use for my little one, the shampoo and body wash namely. Have repurchased them over and over again and love it. Also I have reviewed the Mama Range few months back and I like using the MamaEarth Under Eye cream as my full face cream. 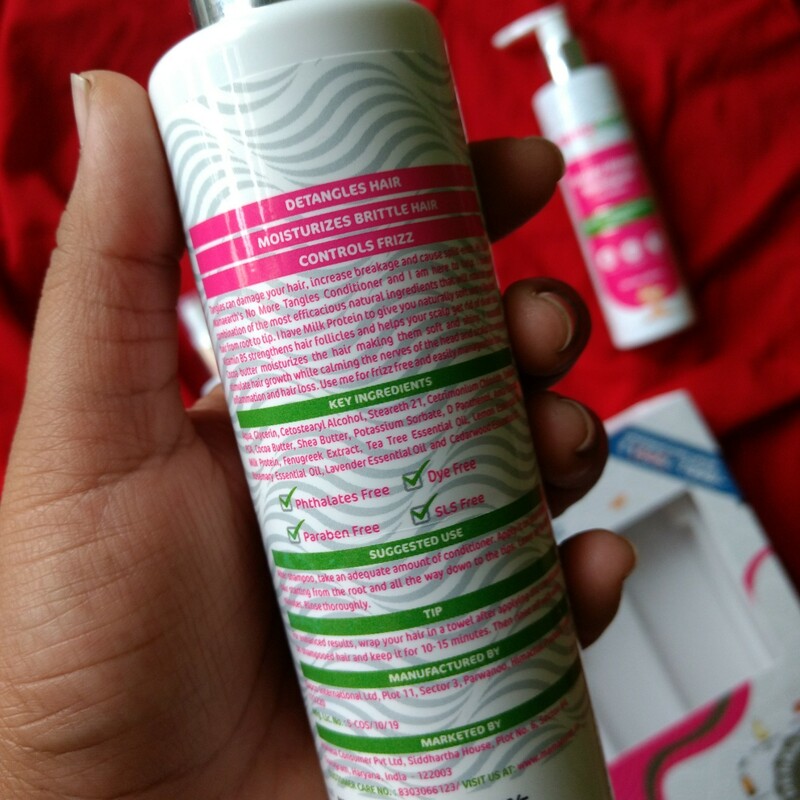 Today we will be checking the review of Anti Hair Fall Kit which I had received during Diwali. The MamaEarth Anti Hair Fall Kit contians a Shampoo, Conditioner, Hair Tonic and Root Restore Oil. The kit retails at 1596 INR but is currently on sale and is priced at 999 INR. Claims - Hi! 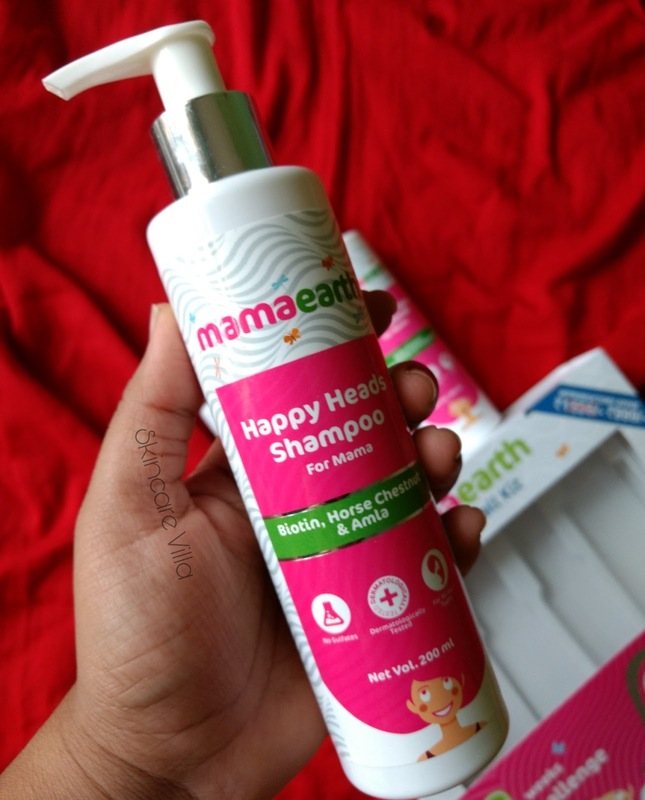 I am Mamaearth's Happy Heads shampoo. I gently cleanse and promote healthy scalp and hair by removing the built up residue from scalp. I have Bhringraj & Amla for hair nourishment and Biotin which makes hair thick. I am free from harmful chemicals like SLS, paraben, phthalate, dyes and artificial fragrance. Use me for clean and healthy scalp by deeply nourishing your hair from roots to tips. Ingredients: Aqua, Glycerin, Sodium Lauroyl Sarcosinate, Lactic Acid, Olive Leaf Extract, Horse Chestnut Extract, Sodium Cocoamphodiacetate, Linoleic Acid, Biotin, Potassium Sorbate, Vitamin E & A, Amla Fruit Powder Extract, Bringhraj Powder Extract, Clary Sage Essential Oil, Lavender Essential Oil and Orange Essential Oil. The shampoo is free of phthalates, parabens, SLS and dyes. 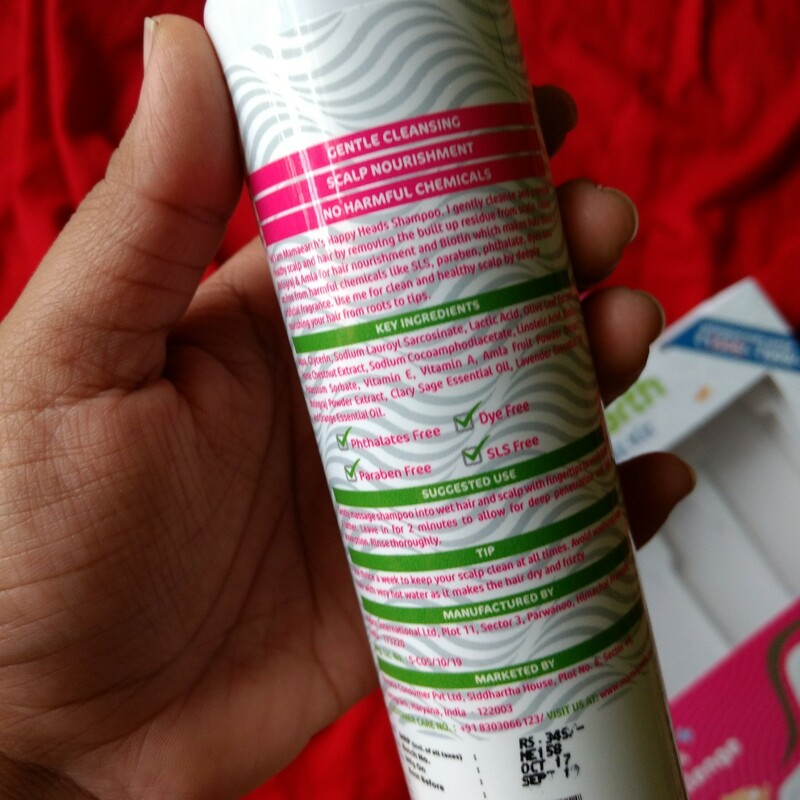 My experience - I used this shampoo without oiling my hair. Whenever I try out a new shampoo (which I rarely do) I make sure not to oil my hair as oiling makes my hair fall, and then I don't get to know why hair fall was due to shampoo or oiling. Coming back, I used a minimum quantity of two pumps twice over my hair and rinsed well with sufficient water. I felt my hair little less cleansed and get like giving another shampoo session to them. After towel drying and letting my hair dry naturally, I found lesser hairfall than usual shampooing. But, my hair felt like a wig, yes you heard it right. My hair were stiff, not dry and didn't have the normal wavy texture they have. It was as if the shampoo residue was left in my hair. Here in Bangalore I receive hard water supply and that maybe one reason ( but I never experienced this with other SLS, SLES and parabens free shampoos). This was a total miss for me. Claims - Frizz & Tangles can damage your hair, increase breakage and cause split-ends. Hi! 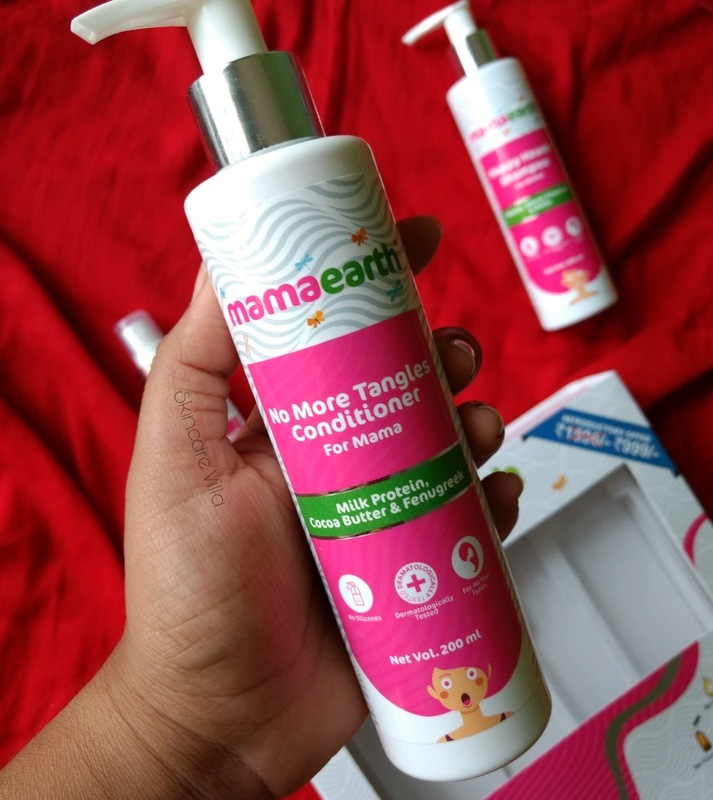 I am mamaearth's No More Tangles conditioner and I am here to help. I have a combination of the most efficacious natural ingredients that will nourish your hair from root to tip. I have Milk Protein to give you naturally soft and silky hair. Vitamin B5 strengthens hair follicles and helps your scalp get rid of dead skin. Cocoa butter moisturizes the hair making them soft and shiny. I naturally stimulate hair growth while calming the nerves of the head and scalp to reduce inflammation and hair loss. Use me for frizz free and easily manageable hair. Ingredients: Aqua, Glycerin, Cetostearyl Alcohol, Steareth 21, Cetrimonium Chloride, Sodium PCA, Shea Butter, Potassium Sorbate, D Panthenol, Amla Extract, Milk Protein, Fenugreek Extract, Tea Tree Essential Oil, Lemon Essential Oil, Rosemary Essential Oil, Lavender Essential Oil and Cedarwood Essential Oil. The conditioner is free of phthalates, parabens, SLS and dyes. My experience - I am not much of a conditioner person actually. Using a conditioner makes my hair limp and makes my face look way too big. Although I did try the conditioner for three times before reviewing it. Each time it reduced my frizz but didn't make my hair soft and manageable. And no matter how much amount of conditioner I used, it was all soaked up. The conditioner smells good and I like the way my hair smelled after application. The other two products in the kit are MamaEarth Pro-Growth Hair Tonic and MamaEarth Root Restore Hair Oil which I haven't used and may not use since my hair fall is due to low iron binding capacity of my body and usually am on iron tablets which definitely makes my hair grow and arrests hair fall. Apart from the above stated products, I would like to suggest that investigate the root cause of your hair fall and then use a hair fall product. 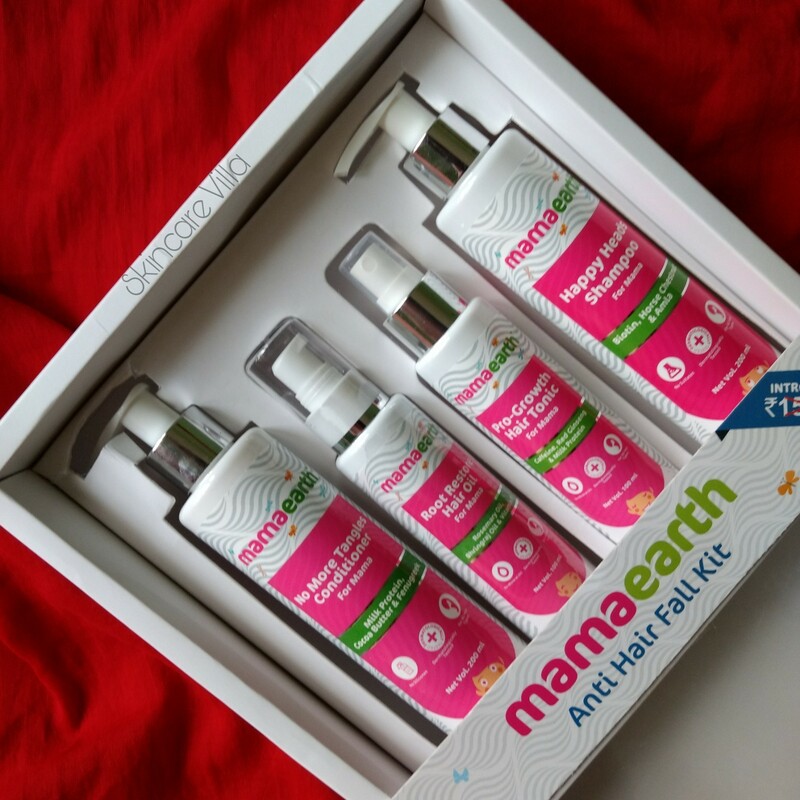 Overall speaking the Mama Earth Anti Hair Fall Kit was okayish for me keeping in mind the shampoo and conditioner. The other two products I didn't use so I cannot claim whether the 6 week challenge is worth taking or not. Also every person's hair and their needs are different. So I would leave it up to you to try it or not.